One of the pillars of the web has always been online shopping. Billions upon billions of virtual (but real) dollars trade hands each year in the space — much of it simply because it’s fast and convenient. But as the web has matured, so have the opportunities to expand beyond the basics. What started as online shopping, also quickly become online selling. And the two formed a natural fit. And now we’re in the social age of the web, where yet another layer is being added. And that’s the sweetspot that Storenvy is in. The San Francisco-based startup has slowly built up a mini empire of both buyers and sellers in their ecosystem. Over 60,000 community shoppers now visit their 2,800 community-run stores to browse and buy. And the stores are really the key. 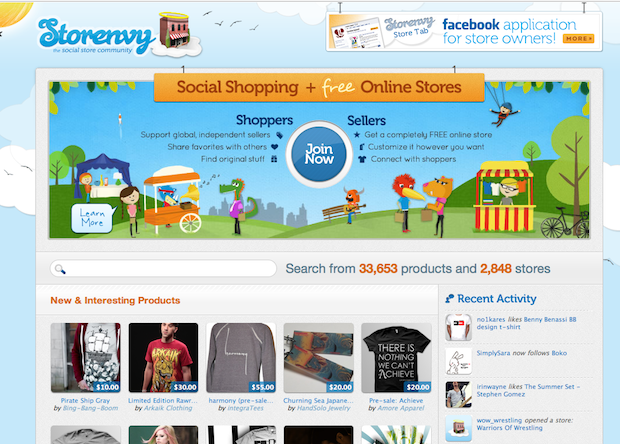 Storenvy gives anyone the tools to create and open their own online store to sell whatever they make. And they can then easily promote everything on networks like Twitter and Facebook, or on Storenvy’s own main marketplace. And Storenvy gives the community all of this for free. Why? CEO Jon Crawford envisions an online world where Storenvy does for e-commerce what Tumblr has done for blogging. That is, make it more accessible and social. Of course, when you’re giving everything away for free, the money has to come from somewhere. And for now, the company has found quite a bit of it — $1.5 million, to be exact. That’s the amount of their just-closed seed round of funding led by Spark Capital and First Round Capital. And aside from those two big players, Storenvy’s round also attracted interest from the likes of Kleiner Perkins and Charles River Ventures. And a group of angels are on board as well, including: David Cohen, John Maloney, David Cancel and David Hauser & Siamak Taghaddos. Seeing as Maloney is the President of Tumblr, and Spark is one of its big investors, Crawford seems to have the right people on his side to become that “Tumblr for e-commerce”. With the money, Storenvy plans to expand their team to fuel growth. In particular, they’re looking for Rails and UI people to build out the core team. And once they build out the team and build out the product, the plan is to eventually go the freemium route; give away the majority of stuff for free, then charge a bit here and there for extras. That model should keep would-be sellers very interested as they keep their transaction and listing fees.